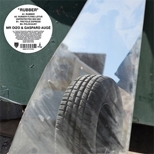 'Rubber' is the title song for the soundtrack to Oizo's second self-made feature film, and although it is a collaboration with Justice's Augé it sees none of the latter's populist touch brought to the party. Instead the acquired-taste vein of 'Positif' and 'Pourriture' continues, here with a relentless manic schizoid feel that resembles nothing less than a proto-Boys Noize. The Flying Lotus remix, although slightly more frenetic than you might expect, works to much greater effect.